Curiosity’s onboard laboratory includes seven so-called “wet ” experiments designed to preserve and identify suspect carbon-containing components in samples drilled out from rocks. None of the foil-capped metal cups has been punctured yet, but vapors of the fluid, known as N-methyl-N-tert-butyldimethylsilyl-trifluoroacetamide, or MTBSTFA, leaked into the gas-sniffing analysis instrument early in the mission. Curiosity landed in a 96-mile wide impact basin known as Gale Crater in August 2012 to determine if the planet most like Earth in the solar system has or ever had the chemistry and environments to support microbial life. Scientists quickly fulfilled the primary goal of the mission, discovering sulfur, nitrogen, hydrogen, oxygen, phosphorus and carbon in powder Curiosity drilled out of an ancient mudstone in an area known as Yellowknife Bay. That paved the way for a more ambitious hunt for complex organic , an effort complicated by the MTBSTFA leak. “This caused us a lot of headache in the beginning, frankly, because it has a lot of carbon in it and other fragments that can break apart,” Curiosity scientist Danny Glavin, with NASA’s Goddard Space Flight Center in Greenbelt, Maryland, said on Tuesday at the Lunar and Planetary Science conference in Houston, Texas. “We’ve turned this sort of bad thing into a good thing because we’ve learned how to work around this leak. We’ve actually used this vapor from this leak to carry out derivitization,” he said, referring to the to tag organics. 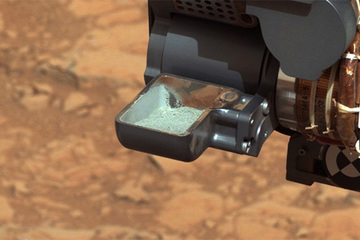 Samples drilled out from Yellowknife Bay were stored inside the Sample Analysis at Mars, or SAM instrument, as the rover made its way over the next two years to Mount Sharp, a three-mile high mound of sediments rising from the floor of Gale Crater. “These samples were just reacting with this MTBSTFA vapor, reacting with all that good organic stuff. That turned out to be a good thing,” Glavin said. In addition to analyzing the doggy-bagged sample that had been reacting with the MTBSTFA vapors for two years, scientists also were able to compare the results with residue from a sample that had been heated twice, effectively killing off any volatiles, but which also had been exposed to the vapors for two years. Initial results show indigenous Mars complex organics in the fresh sample, though more work is needed to definitely peg the compounds. “It’s probably going to be years of work trying to disentangle this story,” said Glavin. “This is really exciting stuff. We’ve got a mudstone on Mars in a habitable environment. There was a lake there at one point. We’ve got organic molecules, possibly some interesting ones, of astrobiological interest. Bottom line, this sample has an even more diverse set of organic compounds than we previously thought. “Million dollar question? Is this or not. I wish I had an answer I can’t tell you. We’ve got basically a few compounds that we’re dealing with here. You probably need a lot more before you can start discriminating between biological and non-biological origin,” Glavin added.